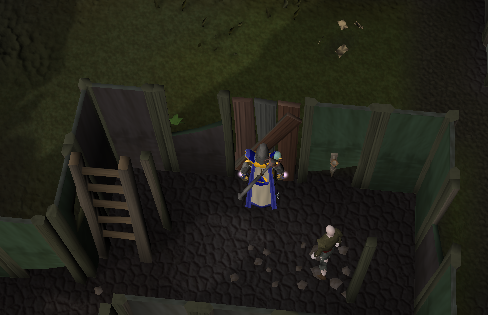 The Myreque have successfully moved their secret base headquarters to Burgh de Rott, but now there are even deadlier dangers than before: the Vyrewatch! Can you assist the Myreque in finding their resistance fighters? Fighting tooth and nail against the vampyre overlord, Drakan, the Myreque have moved their secret base camp to Burgh de Rott. Now the fight starts in earnest! Veliaf needs someone to make their way into the Sanguinesti region - the eastern side of Morytania cut off from the west behind an impenetrably huge wall. Will the fight be supported by Myreque resistance inside the vampyres' domain? 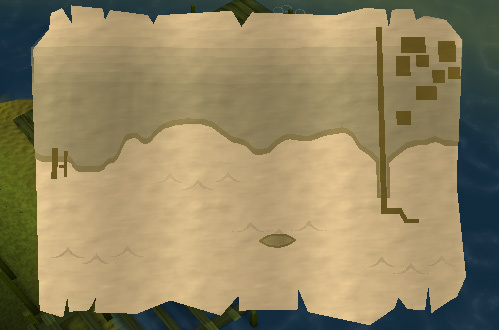 What grim discoveries are to be found behind that dread wall? 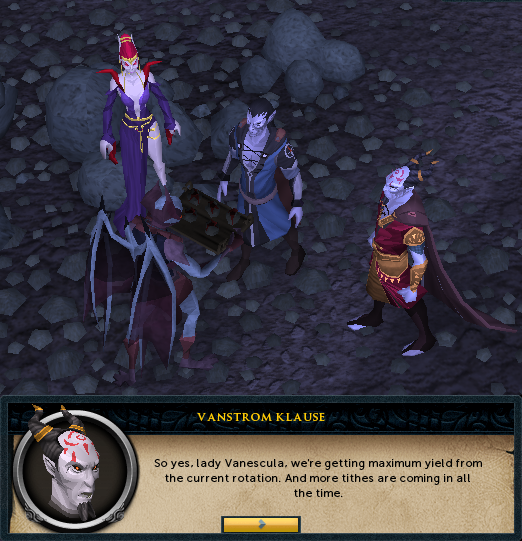 And what of the Vyrewatch - deadly sky-bound patrollers of the blood-tithed lands of Meiyerditch? Only a daring, quick-witted agent with an eye for detail can hope to pick their way through the tumbled down slums of Meiyerditch. Begin by speaking to Veliaf Hurtz in the Myreque base camp in Burgh De Rott. Begin by going to speak with Veliaf in the new Myreque hideout at the basement of the Burgh De Rott Inn. Ask him if there's anything you can do to help out. Afterwards, ask him the last option to start the quest. Get your planks and nails ready, and head south of town until you find a large dock with a boat on it. Use a plank on the boat. 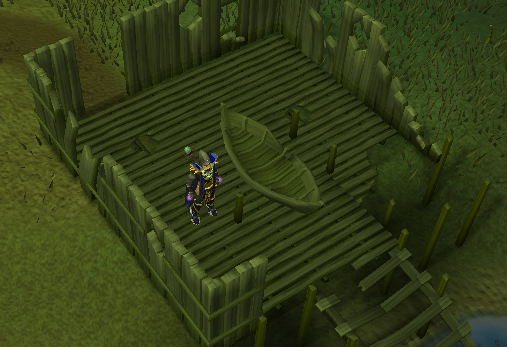 Now, look at the boat chute and use a plank on it. Push the boat down the ramp, and board it. You should be relocated near some ruined walls. 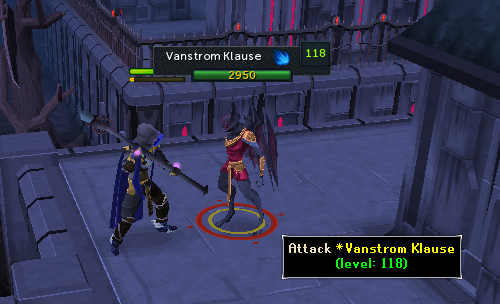 Be careful here; do not attack the Vyrewatch, as they are invulnerable to all weapons! They won't attack you, though. If they decide to take your blood, choose to distract them. However, this may not always work, and they will drain life from you. You can also purchase citizen or Vyrewatch clothes from Trader Sven. 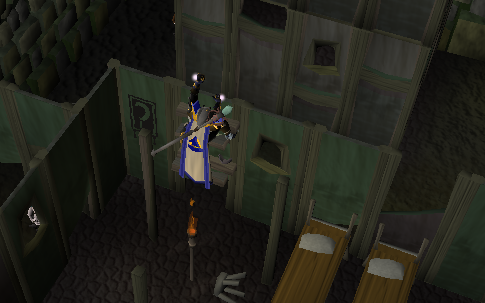 The clothes will allow you to pass unnoticed from the Vyrewatch more often. At this point, just keep running on the wall to the north, until you get to the sections of the wall where there are some planks. Search the first section, and kick it down. Go Down. A tad north you should see a few rubble that go over the wall and on to the city. Climb them. 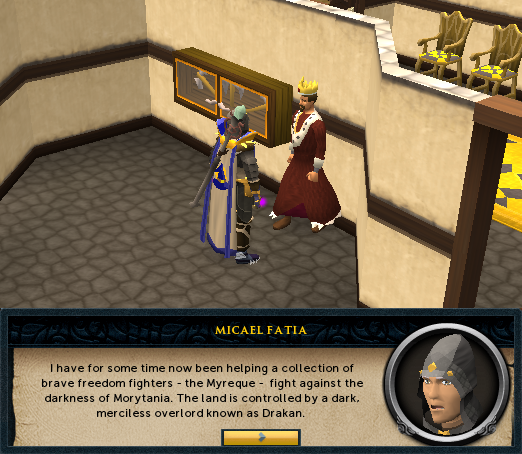 Talk (whisper) to any citizen, and ask them about the Myreque twice. After, they should point you to Old Man Ral. To find Old Man Ral, go a little bit north. When you speak to him, he will ask you how they call him. Call him the Sage of the Sanguinesti. 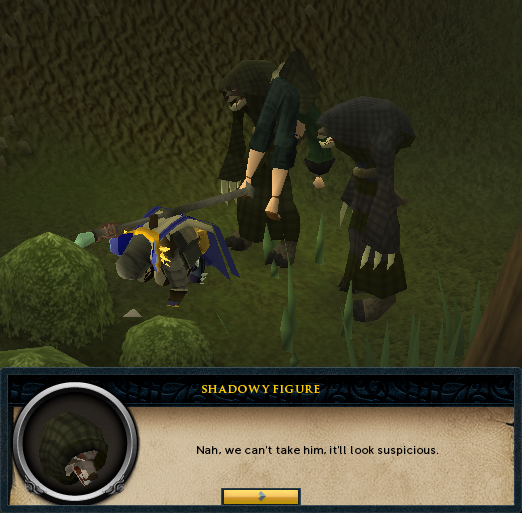 Tell him that you need to find some "Hidden" people, And then tell him you need to contact the Myreque. He will tell you that you need to head to sector 3, and that it is a hard route. 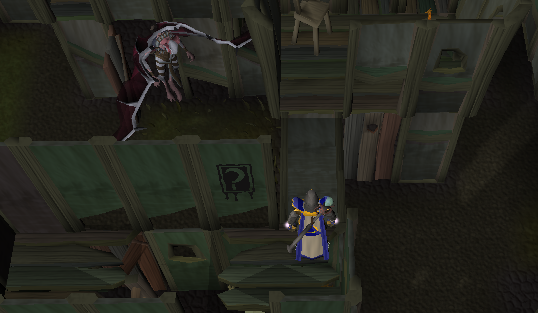 Now begins the Agility course. Beware: Most ladders are misleading, so follow the instructions carefully. I recommend you always look north so you can follow the instructions properly. 1. Begin by climbing the ladder in the house south-west of Old Man Ral. 2. Jump the floorboards to the south building. 3. Jump the floorboards to the eastern building. 4. Push the wall a few steps north and walk across it. Then crawl across the floor. 5. Walk north again. 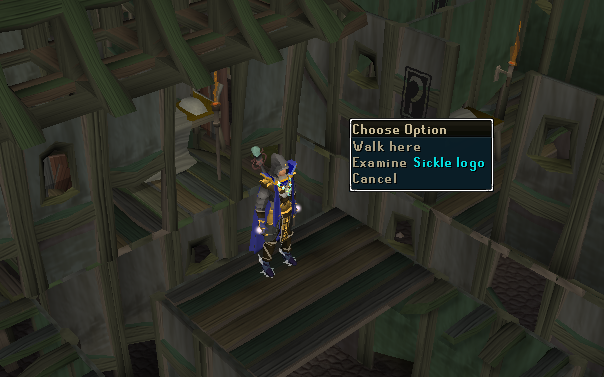 Find the sickle logo and push the wall, then walk across. 6. Go down the stairs to search a table. Go down the trapdoor. 7. You are now in another room with a logo. Climb the shelf next to it. 8. 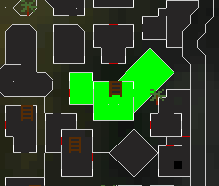 You are now in a small room with no doors. Crawl under the eastern wall. Then jump to the floorboards to the east. Go down the stairs. 9. 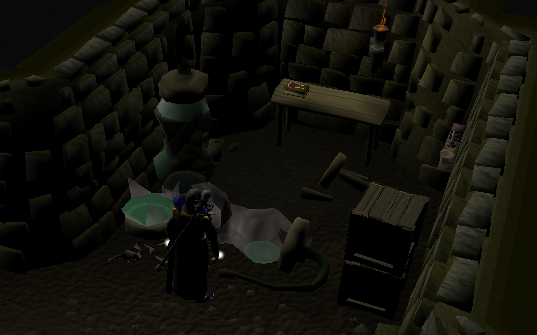 Search the pots to get a key. 10. Open the door. Walk east to a ladder and climb it. Walk south and jump the floorboards next to the bed. 13. Go east. Walk across washing line. Climb down the ladder. Push the wall to the north. Walk across. 14. Climb up the shelf to the north. Climb down the shelf in the northeastern side of the room. Look north and jump the floorboards. Walk north and jump another set of floorboards. Then walk a little and jump the floorboards to the east. 15. Climb up the ladder in the room with another logo. Look west and search the wall. You will find the “topmost part of a ladder”. 16. Go back down the stairs and fix the other ladder. Walk down the ladder. Open the door. Tadaa, you are now in Sector 3! Climb the ladder, jump to the next building, go down the ladder and search the Wall. You will need a Knife to go in there. If you brought your own, you can proceed straight ahead. Use the knife on the wall to enter the next room. You will now be in the room with an odd tapestry on the floor and a sickle on the northern wall. Push the sickle and search the rug. You should find a hidden staircase. Climb down, and head north to find Vertida Sefalatis. Talk to him, and tell him you where sent by Veliaf. He should give you a Message to deliver to Veliaf. You can teleport or make your way back through the city. I suggest using the Ectophial. Go back to the Inn in Burgh De Rott, and give your message to Veliaf. He will tell you that the situation is dire, and that odd things are happening at Paterdomus as well. 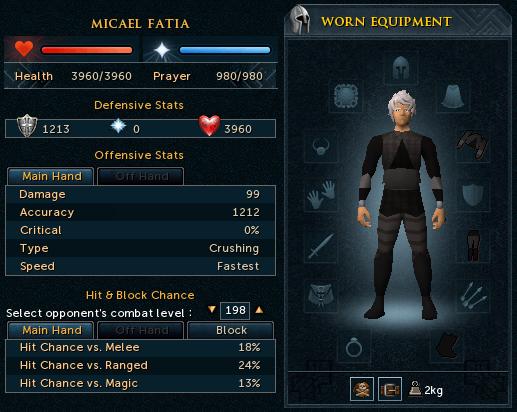 He will suggest calling aid from King Roald of Varrock. He will ask you to go speak with Drezel, in the Salve temple, Paterdomus. Speak with Drezel, and select all possible options. He will tell you about strange noises. 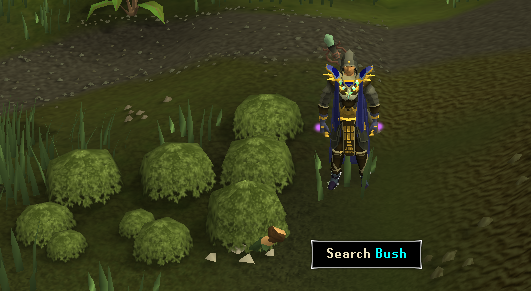 Go outside to the west side of the temple, and search the bush patches on the south side of the road. You will get bashed, and you will see a short cinematic of two werewolves discussing with each other. Go back inside the temple and speak with Drezel Again. 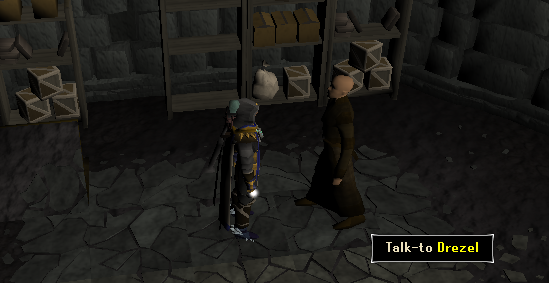 He will tell you to go speak with Roald and will give you a Varrock Teleport to get there faster. 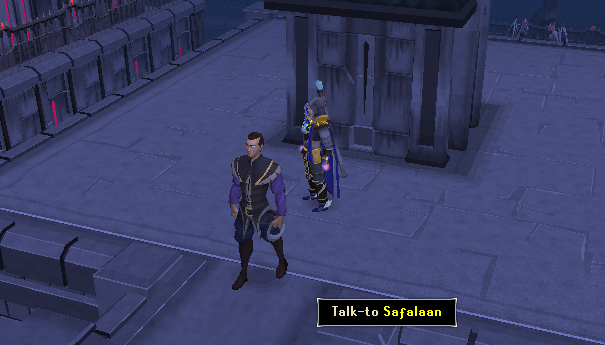 Speak with the king, and you should be able to explain a lot of the current situation to him, however, his advisor keeps arguing that they cannot do anything without asking the Saradominist church and disrupting the balance set by Guthix. He says that another god war will ensue if they send an army immediately. After the long discussion, ask him every possible option. You will need to return to Veliaf. Roald will ask his advisor to teleport you to Paterdomus. Accept. Talk with Drezel again and explain to him the current situation. 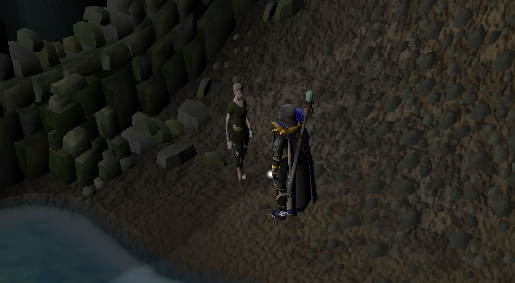 You may ask him what the Guthix edicts are, and you may also proceed by asking him what to do next. Head to Veliaf. Explain to him that you got attacked near the temple and that Roald cannot send troops. 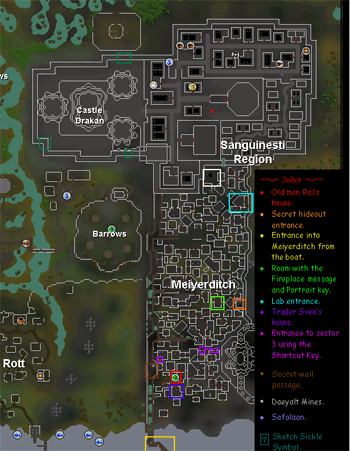 You must head back to the Meiyerditch Hideout. 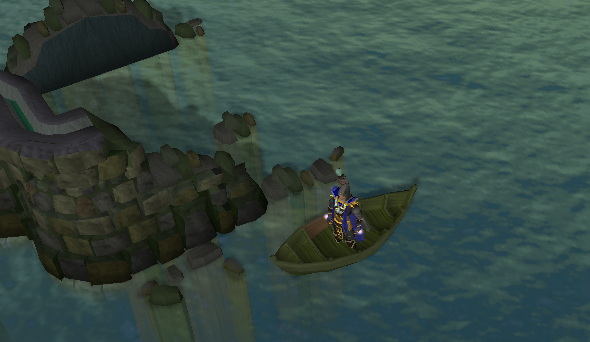 Take the small boat to Meiyerditch again. This time, you don't have to go all the way through the city, there is a shortcut there... If you want, bring your own pickaxe for this part. And If you don't have one, talk to one of the miners they will give you a bronze one for free. Walk around and draw the Attention of one of the Vyrewatch. Ask them to send you into the mines. 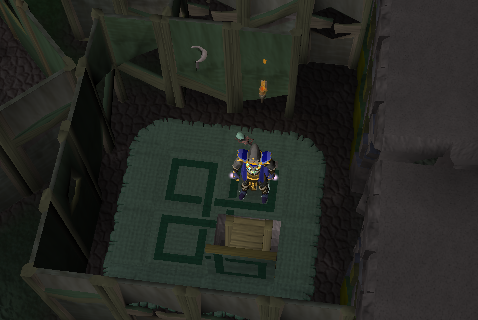 In the mines, you have to mine 15 Daeyalt Ores and put them in the cart in order to get out. 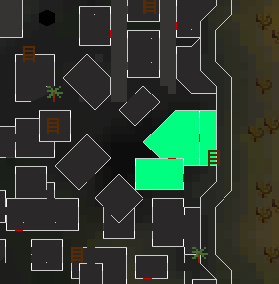 The Daeyalt Walls contain 3 Ores each. And they mine pretty fast too. (More details about the ore at the bottom of the guide) Once you have done that, speak with one of the Juvinate guards, and you will be relocated in the northernmost part of the city. Now, just head south to the building that you used to climb and jump to the next roof to go back to the hideout. Talk with Vertida again, and tell him what happened. He will tell you to seek Safalaan, who is gone to sketch the Drakan castle. He will tell you that he took the wall route. Ask him every other options, and he will tell you he needs to go to the wall, and he will lead you there. Accept. You will be near Old Man Ral's house. 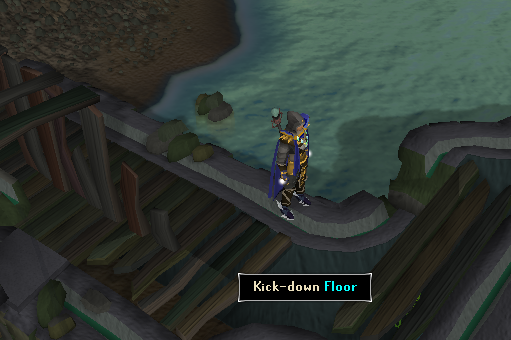 Go south, and climb over the wall rubble that lets you go in the city again. Go up the wall. Now that you are up on the wall again, Run north until you see a ladder. Climb down. 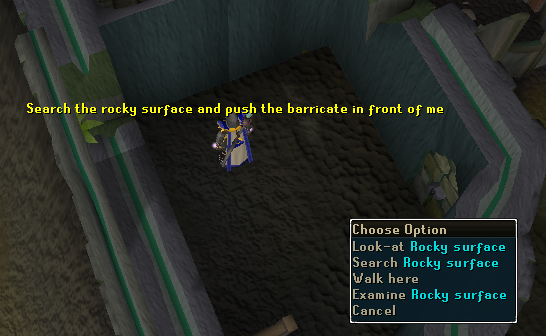 Push the Odd stone on the East wall, and go through the secret barricade. Head north, climb the ladder, run north until you see another ladder, climb up, go to the next ladder, climb down. Now, run north until you find Safalaan. He is near a Dome and intersection on the wall. Tell him about both the king as well as your attack on the temple. He will tell you he needs to run off to the base, and ask him if you can help in any way. He will tell you to sketch the Castle, and he will give you papyrus and charcoal. He tells you that Old Man Ral can give you more. After the cutscene, head on to the first sickle sign you saw (the south one) and prepare for battle. I suggest using protect from melee. When you try sketching, Vanstrom will appear! He will attack you, and knock you out after 3-5 turns. Fortunately, a servant of Vanescula Drakan will appear and save you. Check if your third sketch is done. If not, do it again. 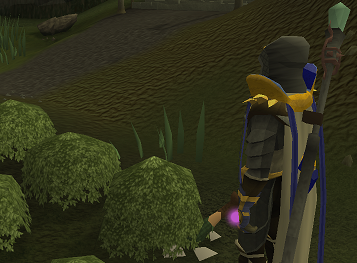 Now, attract the attention of a Vyrewatch, mine some Daeyalt, and head to the Hideout again. Before going in the hideout, go in the purple highlighted house, use your Knife on the portrait, and search it for a key. 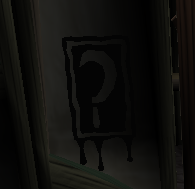 Use your knife on the fireplace afterwards to uncover a Hidden Message. Read it if you want. Speak with Safalaan once inside. Tell him you got attacked by Vanstrom, and also you will tell him about Guile. Show him the Hidden Message you found on the fireplace. Now, you will have to find Guile's Lab. 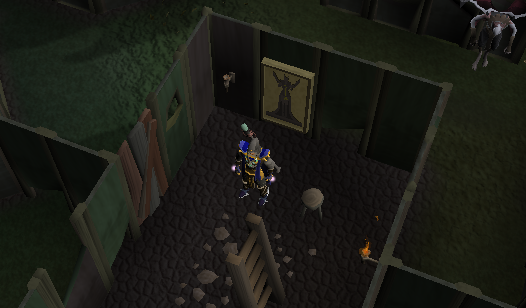 Use your knife on the tapestry, then place the ornate key on the Vampyre Statue. The door should now be unlocked. Walk through it. Go down the stairs, and you should be inside the laboratory. 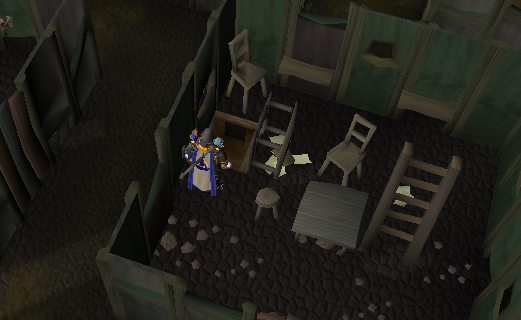 Search the rune case for some runes. Now, you will see book on a table... It is out of reach. Cast Telegrab. Head out the laboratory and go back to the hideout. Give the book to Safalaan, and he will give you a Shortcut Key and a Sealed message for Veliaf. Now, you can use the shortcuts. Remember those odd painted doors? Those are the doors you can open. Just use your new key on them to open them. 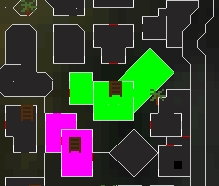 The shortcut doors are marked in pink on the map. Now, make your way back to the Boat and Board it, or teleport, and head back to Veliaf. Show him the sealed message. He will also promote you to Private within the Myreque ranks, and give you a Tome of Experience! A Tome of Experience (3) that gives 2,000 Experience of your choice per chapter. There are 4 options: "Read," "Use", "Destroy" and "Examine." Myreque "Private" rank. Shortcut Key. 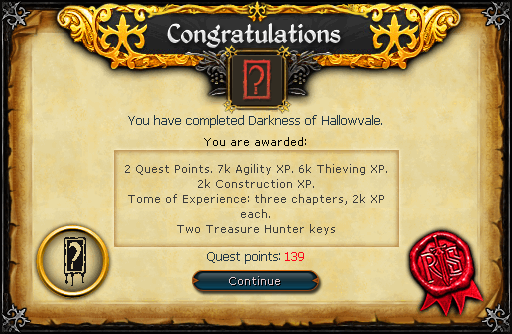 7,000 Agility experience 6,000 Thieving experience 2,000 Construction experience Two Treasure Hunter Keys Ability to mine Daeyalt ore. 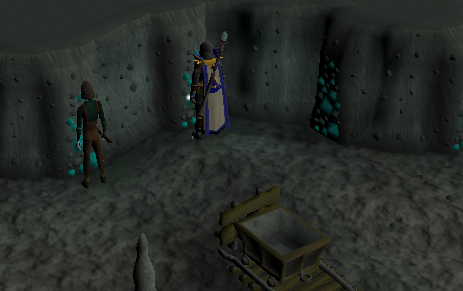 Requires level 20 Mining and gives 17 experience per ore. Each rock contains three ores. Ability to Purchase Vyrewatch and Citizen Clothes from Trader Sven in sector one. You only need to be able to reach him, and you don't need to complete the quest to buy or trade them. The sets increase your chance to have the 'Distract' option work more frequently and thus needing to give a 'Bloodtithe' less often. They are made of 3 pieces, Top, trousers and shoes. They look slightly different on females as well. 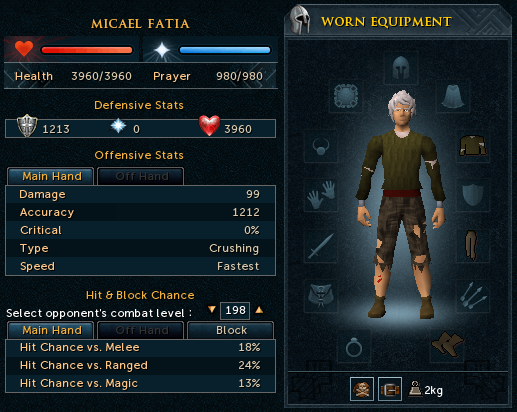 Vyrewatchset costs 650gp each while citizen clothes cost 6gp each. Note: Follow the instructions carefully because of the mass of misleading ladders.